The Tea Box: All for one, one for all? No: All for All! It rains, it’s a dull Saturday, damply meditative, what could I be talking about then if not POETRY!?! Are you waiting? Take a look! birds are singing with great joy! what a nice, amazing new! Have I grown mad? Maybe... Or maybe this book is simply contagious! I just can’t get the music of words out of my mind, any time I try to compose a sentence it comes out in rhyme, am I serious? Julian Tuwim is a monument of Polish literature: born in Łódź in a family with Jewish origins, during World War II he emigrated to France first, then to Brazil and America last. He went back to Poland, where he died in 1953, only after the end of the big war. If I had to tell you about Tuwim exhaustively a tome wouldn’t be enough, I therefore shall give you some basic information: in 1918, together with Antoni Słonimski, Jarosław Iwaszkiewicz, Kazimierz Wierzyński and Jan Lechoń, he founded the poetical group called Skamander through which they tried to release Polish poetry from the prominently patriotic role it had up to that moment, to make it more comprehensible to common people by simplifying language and rejecting cross-references to mythology and figures of speech traditionally used. Tuwim uses experimental poetry, inserting typical common situations and expressions with frequent dialectic contaminations, to grow away – more than anyone else did – from predominating mannerism. His most known writings are probably "Bal w Operze" (The Ball at the Opera), and "The Locomotive", together with his wonderful poems for kids, our main object today. 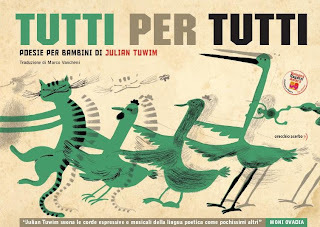 Tutti per Tutti, at first published by the Polish Publisher Wytwórnia under the title "TUWIM. WIERSZE DLA DZIECI", won the Special Section of the Bologna Ragazzi Award devoted to poetry, in 2008. The accomplishment obtained with this volume is enormous, in fact it contains seven graphic projects edited by different artists who therefore gave seven different interpretations of Tuwim’s imagination, with results that are distant as much as surprising. Sole junction point: his poems. As you can see Urbańska, who illustrated four poems "Un Conto Complicato", "L'Alfabeto", "Gelo" and "Le Verdure"(1), prefers using materials on a white background, no matter if its scrap materials, collage or images obtained by using moulds immersed in colour. Her images seem to pop out of the page, together with words changing body and font to support the lyric’s rhythm. Hanulak gives a definitely more pictorial interpretation – hers the versions of "La Rapa" cover image is obtained from this poem, "Micio", "Bambo", "Il Signor Trallallini" and "Scherzetto"(2) – with a taste that goes from retrò, obtained as well using old ruined papers as background and a two-colour print (La Rapa), to a modern tribal (Bambo) with a clean mark and backgrounds, to grotesque (Il Signor Trallallini, Micio and Scherzetto) that reminds me of some advertising campaigns from the 60’s and 70’s. Gurowska gives a markedly graphic interpretation of the three poems she was assigned, "Pettegolezzi d'Uccelli", "Due Venti" and "Locomotiva"(3). For all tables she uses a white background, images are extremely linear, a nice cross-reference with the text that results amplified and represented with great effectiveness. Marta Ignerska, who moreover is the author of the beautiful L'Alphabet des Gens (People’s Alphabet) published this year by Le Rouergue has illustrated "I Due Gini", "Gabri", "Radio Uccello", "Gigio Sognatore" and "Sofia - Tuttoio"(4). Her mark, often blunt and softened, gives an almost dreamlike vision of the texts she has been assigned. Great, to my opinion, the representation she gave of Radio Uccello (above): strict chromaticism with red, black and strokes of shades of blue and green, at times almost unperceivable others more evident. Compared to other tables, here there are fewer characters; images are therefore easier to read. The original cover of the book, in the edition by Wytwórnia, was by Niemierko: it had been taken by one of the tables of the poem "L'Elefante Trombettoni". Hers as well the illustrations of "Cecco Bugiardino e Sua Zia", "Gli Occhiali", "Click", "In Aero-plano" and "L'Usignolo in Ritardo"(5). Delicious those images with coarse-grained, at times scratched, backgrounds, a technique she sometimes uses for characters as well. Where Niemierko uses white backgrounds, as in "Click" (above) and "L'Elefante Trombettoni" for instance, heavy pencil marks or graphic signs intervene to trace evident points or zigzagging lines. Her characters, outlined with pronounced black or blue outlines, have rounded reassuring shapes. Colours, in this case as well, are very few: red, light blue, white, blue and black. Wonderful, to me, Click’s graphic! I am certainly wrong though, if I observe the backgrounds Agnieszka Kucharska–Zajkowska has used for her images, I have the clear impression I am looking at material surfaces’ pictures perfectly touched up, that almost give the impression of Moon’s surface. 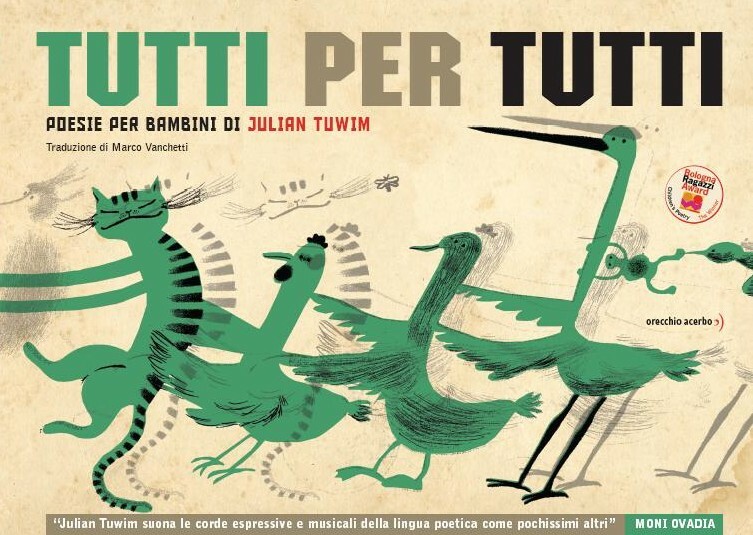 On those backgrounds, to which at times she adds touches of pencil and colour, she outlines characters with stereotyped features – as in "Il Signor Piccini e La Balena" (above and below) – or common objects and characters having a more graphical approach, almost recalling the rigid shapes of Lego – as in "Tutti per Tutti"(6). By Justyna Wróblewska are the illustrations of "Pioggerellina" (above), "Prodigi e Stranezze" and "Va Tobia" (below) (7). She has created three completely different tables: "Pioggerellina" has a strong graphic approach, obtained by adding superimpositions of letters, graphic characters and murkiness effects, simulating thunders and lightning, to small touches of blue (very well done to my opinion); "Prodigi e Stranezze" has a mixed technique, reworked at the computer, to create a rightly surreal atmosphere, almost tropical-dreamlike; last "Va Tobia" where the collage composing the village’s road is enriched by simply sketched pencil drawings and italic writings, this ensemble confers to those images a simple, rural characteristic. Enormous as well the enterprise of translating those poems into Italian, translation was made by Marco Vanchetti to whom goes all my appreciation for having obtained such a good result in such a complicated task. Shortly, this is a real poetical anthology with many faces and strong irony, Tuwim’s irony of course: he, who was able to grasp the comic side of life in an historical moment where everything was tragically real. In a cultural – or better artless – moment like this, deciding to publish poetry is an act of courage, something that goes against the tide, an act I personally welcome with great joy and with the confidence that, were we able to make others love poetry, it would regain all the strength it used to have in past times. (1) "A Complicated Calculation", "The Alphabet", "Frost" and "Vegetables"
(2) ”The Turnip", "Pussycat", "Bambo", "Mr Trallallini" and "Little Joke"
(3) "Birds’ Gossip", "Two Wind" and "The Locomotive"
(4) "The Two Gino", "Gabri", "Radio Bird", "Gigio the Dreamer" and "Sofia - Iknowitall"
(5) "Elephant Bigtrumpet", "Cecco Liar and His Aunt ", "Glasses", "Click", "In Aero-plane" and "The Nightingale is Late "
(6) "Mr Small and The Whale" and "All for All"
(7) "Drizzle", "Wonders and Strangeness " and "Tobia Goes"
The titles above are my translation, with all possible mistakes! Sorry for that! Copyright© text and images by Orecchio Acerbo 2010. Images have been reproduced with the permission of the Publisher, all reproduction is prohibited. So excellent. Thanks for this great review Christina. And thanks also for your thoughts that poetry is the living beating heart of culture, a way of life that refuses to give in to mass amnesia. P.S. Will you be in Paris this year?? Hi Zoe! Sorry I made a mess with your comment: I tried to cancel your e-mail address and ended up erasing the comment! I shall help you with pleasure!!! I'm a bit busy thise days but I shall send you an e-mail soon!